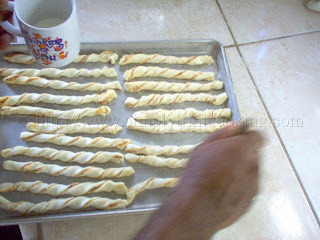 The second recipe I was introduced to was cheese straws which I loved immediately.And it is also easy and quick to make, especially if you have the dough prepared in advance or store bought.My brother-in-law had the pastry already prepared. 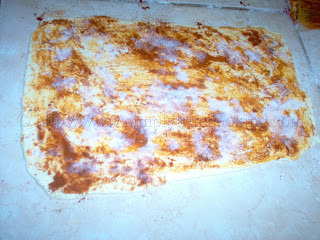 However, I have the recipe for pastry dough here if you want to start from scratch. 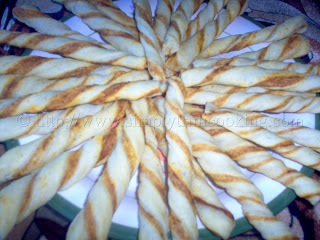 These cheese straws helped liven the spirits of all who were present in the patio. They were even eaten slowly to be savored; wrong! We couldn’t eat it any faster from the oven.I have added this recipe to my Christmas List to serve guests this Christmas coming. Mix flour, salt, and baking powder. Cut in the shortening. Pour hot water over butter and stir to melt. Add lemon juice, egg yolk, and mix well. Stir liquid into dry ingredients and knead. Please note: Exact measurement is based on your taste, you may want to add more Parmesan (like me). Clean and dust with flour the area in preparation of rolling out the pastry dough. Roll out the pastry dough. Spread the paprika on the dough. Brush with the milk afterwards. 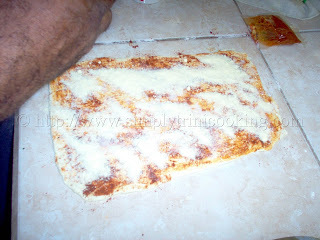 Spread the cheese and fold the dough in half. 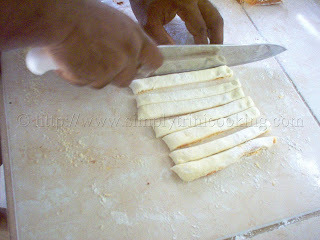 Cut the pastry in narrow strips. Twist the strips and place onto a lightly greased cookie sheet. Brush more milk on the strips. Bake in a preheated oven, 425° F for 15 minutes or until it is golden brown. Well that’s it for another post. Bye! Coming up next, a few East Indian recipes. can the dough be made in the food processor? 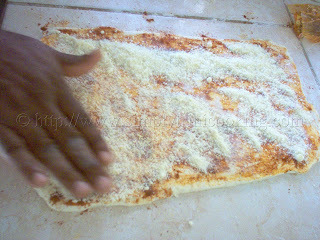 It is better to knead this dough by hand, since it is a stiff type of dough. Don’t forget to freeze it when done! how long should i freeze the dough? and how thin should i roll it out? This dough can be used once chilled thoroughly. Therefore, it might be best if keep in the freezer overnight. 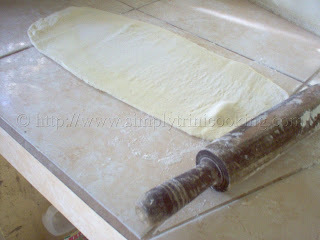 Roll the dough to about 1/3 of an inch. do u have to use only the yolk of the egg or the whole egg ? It says 1 egg yolk so I would use the egg yolk alone. Is the dough supposed to be very soft before freezing? Or do I have to add more flour? I followed the dough recipe exact but it’s a strange consistency. You’ll have to elaborate on the strange consistency. Only then I can give an answer. Pretty site! This was a really wonderful post. Thank you for providing this information. What can I substitute for egg yolk? u know for interest of vegetarians! I would prefer you use a different pastry dough that doesn’t use egg yolks. HELLPPPPP!! i need to try the currants roll recipe but I don’t have a pastry dough recipe without egg yolk. I guess it’s just the skill but I believe anyone can do it.